Another dehydrator adventure! As promised, I’m sharing my beef jerky recipe with you. I’ve made 4 batches since the dehydrator arrived, and I’m betting I’m due to make another. You see, my husband isn’t really a “sweets” guy. All of the chocolates and candies in the world don’t faze him. (Except maybe these chocolates!) To show my love and appreciation for him through food, I make enchiladas, roast chicken, or chili. Although judging by its popularity, I think that this beef jerky very well has been added to this list of favorites. 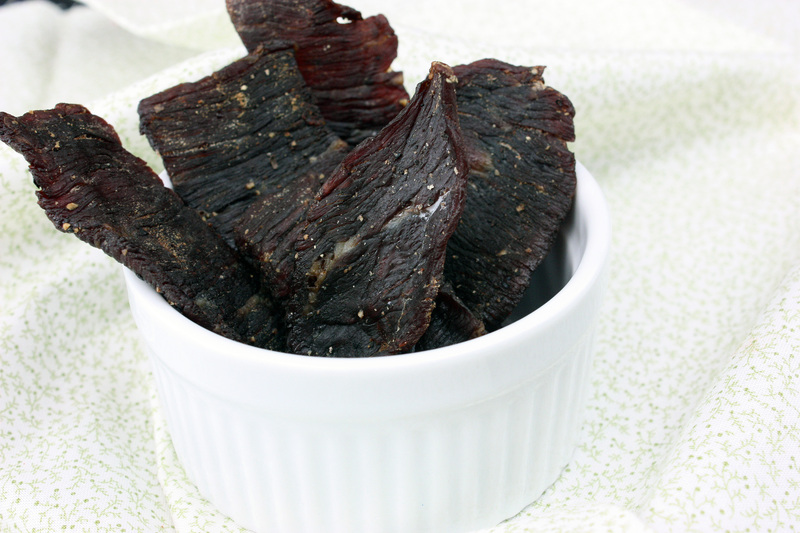 This jerky is easy to make and while I haven’t measured the nutritional value, I’m sure it’s lower in sodium and healthier than the packaged stuff. My husband and I also think it tastes better – it’s slightly spicy, and the flavor is fuller. Of course, it’s also gluten-free. It’s perfect as an on-the-go snack when you’re not sure about your next meal, or when you don’t have much time to eat. It’s also wonderful to share, which is the reason why we’ve gone through so much! Place beef in the freezer for about 15 minutes. This will allow it to “firm up” so that you can slice it more easily. Once it is firm, slice your beef across the grain thinly (about 1/8 inch thick or so). Combine the remaining ingredients in a large zip-top bag. Add the beef slices and seal the bag, and toss around to ensure all of the slices are well-coated. Refrigerate overnight or for 8 hours or so. Is your sweetie in need of some more traditional Valentine’s treats? Don’t despair – I happened to check out a few things around the blogosphere, and came up with some decadent delights, just for you! Seal in an airtight container and enjoy! Literally JUST this morning I was thinking about how I wanted to try making Beef Jerky! Im Digging on this recipe. Thanks for sharing it. Haven’t had beef jerky for ages! They look fantastic! yum! I love beef jerky. What brand dehydrator do you use? ATXGlutenfree – I use an Excalibur 5-tray dehydrator. LOVE it! What would be your 2nd choice of meat if London were unavailable? Christy, I think that any lean cut would work – round steak or a top round roast maybe. I’ve used a top round roast and it tasted good – I just like that the London Broil is flatter – makes cutting into jerky-style slices easier! My husband would much prefer beef jerky to cookies or sweets too. We don’t have a food dehydrator. I wonder if I could make it on the lowest setting of the oven? City Share – you sure can! I did that several times before getting the dehydrator. Just set the jerky on racks and you will want to flip it once or twice during the cooking process. Yum! This is going on my must try list! Beef jerky is one of my very favorite treats! I fit into the same category as John – give me savory anytime! I’m going to have to give this a try. All I have is my oven, but I can make that work. Which dehydrator did you get? My son would really love that jerky, Alta! Thanks for letting us know that it works in the oven, too. Thanks, too, for linking up to my chocolate pomerdoodle ice cream! Makes me want some. 🙂 Great roundup for Valentine’s Day! What a fantastic looking recipe! A bonus that there’s no sugar – yay!! Hmm, if I take the jerky angle, maybe I can convince the husband that we need a dehydrator. Thru The Bugs On My Windshield – I got an Excalibur 5-tray. LOVE it. Thanks so much! I can’t wait to make this. I’m always amazed at how coincidence works. . . I was just telling someone yesterday that I never did taste beef jerkey and would love to try a vegan version! Love all these roundup recipes–so many from which to choose! Glad you agree that ice cream is suitable any time of year. 🙂 Hope you have a great V.Day! Beef jerky is one of our favorite snacks to take on hikes. Your homemade version looks wonderful & is so much healthier than the store-bought version! Love jerky, have never made it at home tho. Looks fabulous! Thanks for sharing. I thought about making my own beef jerky today. Now it is time to load up the oven and spice up the beef. You saved me! I was just looking into making this but the recipe that came with my dehydrator I just got calls for 1/2 lb of brown sugar! Seriously! Thank you for this recipe! Could you use it with chicken breasts or fish instead? I can’t have beef and I know you can make turkey jerky? Ari – 1/2 lb of sugar? OMG! Yes, you can use chicken or turkey. I did use chicken once – we preferred the beef, but it was pretty good. I’ve never tried fish jerky, so no idea on that one!